In the 1980s, a mutated kinase was identified that caused white blood cells to grow in this uncontrolled manner and caused chronic myeloid leukemia (CML). The mutated kinase is a hybrid formed from two halves of different proteins that is created when pieces of chromosome 9 and 12 switch segments in white blood cells. The drug imatinib was developed in the 1990s by Brian Druker of Oregon Health and Science University and Charles Sawyers of Memorial Sloan Kettering to block this mutant kinase, called BCR-ABL (breakpoint cluster region — abelson murine leukemia viral oncogene homolog 1). In the years that it has been on the market, imatinib (marketed by Novartis as Gleevec) has transformed CML from a death sentence — patients were often given three to five years to live after diagnosis — to a manageable condition, with a five year survival rate exceeding 90%. Similar fusion genes (and proteins) have since been found in other blood cancers but had not been detected in solid tumors, such as those affecting the breast, prostate, colon, lung, and pancreas, thyroid, kidney and brain. Such solid tumors account for 80% of cancer deaths in the U.S. Some researchers thought that there were no fusions in solid tumors, while others thought they might be there but were more difficult to find because of the many chromosomal defects in these cancers. But in 2005 Arul Chinnaiyan at the University of Michigan found the first gene fusions in a solid tumor, in prostate tumors . Since then he has found more in breast and stomach cancer and myeloma. And in 2007 Hiroyuki Mano and his group at the Japan Science and Technology Agency found one in non-small-cell lung cancer . This fusion, EML4-ALK (echinoderm microtubule associated protein like 4 — anaplastic lymphoma kinase), is a tyrosine kinase like BCR-ABL. And like BCR-ABL, its formation drives tumor formation; so blocking it should halt tumor growth. Crizotinib, being developed by Pfizer, is a drug that blocks fusion proteins of anaplastic lymphoma kinase (ALK). 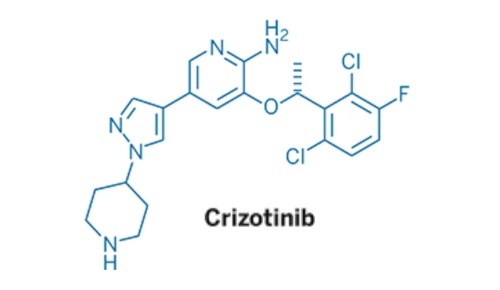 Three research studies in the October 28, 2010 issue of the New England Journal of Medicine (NEJM) highlight crizotinib’s therapeutic potential. Kwak et al. describe a study of 1,500 patients with non-small cell lung cancer . Five-and-a-half percent of them had a fusion containing ALK, like the initial EML4-ALK fusion identified in Japan. Interestingly, most of the patients with the ALK fusions were non-smokers and their cancers were adenocarcinomas (meaning a cancer of epithelial tissue). Over 90% of these patients had already undergone at least one line of therapy, but even so, 57% of them responded well to crizotinib. Butrynski et al. report that crizotinib can also help patients with rarer cancers, like inflammatory myofibroblastic tumor (IMT) . ALK rearrangements have been documented in about half of IMTs. Unfortunately, though perhaps not surprisingly, drugs like crizotinib and Gleevec cannot be the last line of defense. Once they are administered, the kinases they target can mutate to resistant them. The third research study published in the NEJM, by Choi et al., enumerates the mutations in EML4-ALK that confer such resistance to crizotinib . Additional kinase inhibitors are being developed to act as backup therapies for both crizotinib and Gleevec once drug resistance has occurred. Although mutant kinase fusion proteins may cause only a small fraction of tumors, they still affect many people. If five percent of all patients with non-small cell lung cancer end up being positive for an ALK fusion, as suggested by the study of Kwak et al., that translates into 10,000 people every year in the U.S. alone. Crizotinib can also be used to fight ALK-positive non-Hodgkin’s lymphoma and neuroblastoma, a childhood cancer in which 10% of patients have mutations in ALK. Erlotinib is a kinase inhibitor targeting a different mutation that promotes tumor formation in another subset of non-small cell lung cancer patients. And a recent clinical trial of yet another kinase inhibitor made by Roche, RG7204, has had dramatic success targeting a specific mutation in advanced melanoma. But key to the success of these kinase inhibitors is ensuring that they are given to the patients harboring the appropriate mutations. Although the treatment of cancer based on gene expression profiling has been used by oncologists in the clinic, currently there does not seem to be a method for determining which mutations caused a given tumor using morphological or histological means; molecular diagnostics are required. Such diagnostics will allow physicians to personalize medication regimens based an individual’s unique genetic makeup. With personalized medicine, therapeutic options can be chosen based on evidence, rather than instinct. Genotyping tumors should become standard practice in deciding which therapeutics to use against them. In the future, every cancer causing mutant will have a drug designed specifically to combat it and cancer therapy can be truly personalized. Tomlins et al. Recurrent fusion of TMPRSS2 and ETS transcription factor genes in prostate cancer. Science. 2005 Oct 28;310(5748):644-8. Soda et al. Identification of the transforming EML4-ALK fusion gene in non-small-cell lung cancer. Nature. 2007 Aug 2;448(7153):561-6. Epub 2007 Jul 11. Kwak et al. Anaplastic lymphoma kinase inhibition in non-small-cell lung cancer. N Engl J Med. 2010 Oct 28;363(18):1693-703. Butrynski et al. Crizotinib in ALK-rearranged inflammatory myofibroblastic tumor. N Engl J Med. 2010 Oct 28;363(18):1727-33. Choi et al. EML4-ALK mutations in lung cancer that confer resistance to ALK inhibitors. N Engl J Med. 2010 Oct 28;363(18):1734-9.